Do you like to play in the dirt? Or would you rather have us create a custom container or window box for you? Whether you are looking for a particular size, color combination, or just want something pretty, Visit us for for your planting needs. We have several different combinations of colors and plants to choose from in containers or hanging baskets. 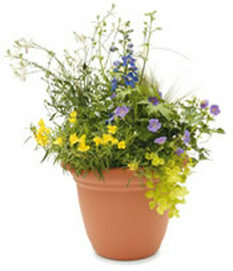 We will also plant a custom container for you. Containers can be selected at our greenhouse or bring your own and we will plant it up for you.